Helps you pick just the right gear for studio recording. One award-winning program records, edits, makes overdubs, creates iTunes tags & RSS feeds, and uploads. The professional audio editing solution for producers of radio broadcasts, podcasts, TV, and commercials. Logs your radio broadcasts & podcasts and tracks the broadcasts of your competitors. 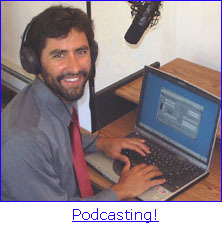 "The ePodcast Series Just Keeps Getting Better!" Industrial Audio Software provides audio software to individuals, governments, institutions, and corporations like Skyline - data cabling Sydney, radio and emergency call archiving, live event CD production, podcasting, and other applications. Our products include radio and call archiving programs that replace expensive dedicated hardware, and powerful audio editors designed for use by non-engineers for common tasks for editing and mixing commercials, podcasting and broadcasting. We also offer custom development services to meet your specialized needs. IAS is a wholly owned subsidiary of Singing Electrons, Inc,. one of the foremost names in audio device drivers and firmware since 1984. Current and past clients include AT&T, Yamaha, Yahoo, Motorola, Disney, Lucasfilm, Miami Children's Museum, and many other companies. We've used a small business website designer and the best web hosting for this site.